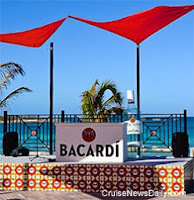 The Bacardi Bar opened on Norwegian Cruise Line's private Bahamian Island, Great Stirrup Cay, this week. 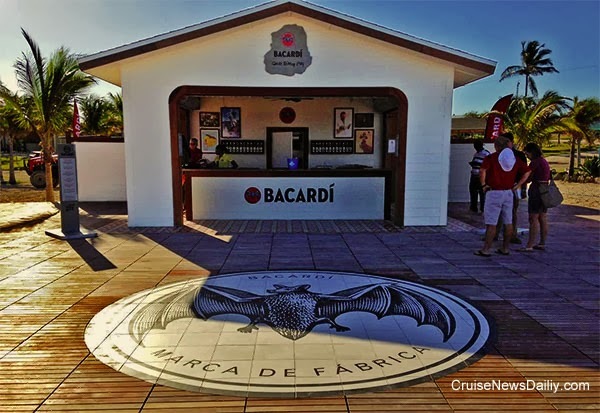 The bar serves a full range of the Bacardi products, and the patio in front of it is used for various types of musical entertainment and events. As you can see in some of the photos below, it sits just above the beach and is only steps off the sand. The Great Stirrup Cay location is Bacardi's first permanent location in the Caribbean. Photos courtesy of Norwegian Cruise Line - may not be used or copied without permission. All rights reserved. We’ve always been able to count on Norwegian Cruise Line for imagination, especially in the way of “secondary” shows that other cruise lines don’t offer. On some ships you can see a cabaret show with “circus style” performers balancing over your dinner table. On others you can enjoy a murder mystery with lunch. And we’ll always remember when you could attend Tony N’ Tina’s wedding with dinner in Hawaii. What clever ideas do the Norwegians have for their newest ship, Norwegian Getaway? 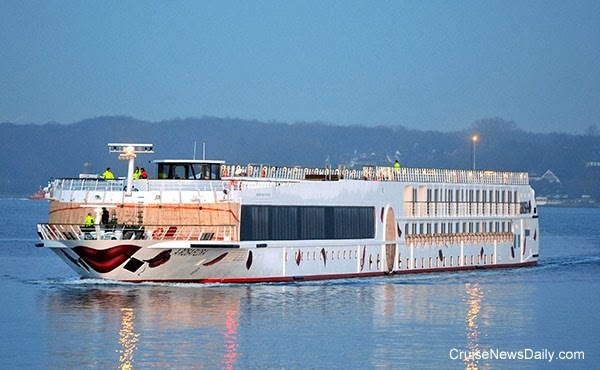 This will only be of direct interest to our readers in the UK, but the rest of us can only wait until US-based cruise lines get the idea and claim they did it first. Fred Olsen Cruises is offering passengers free door-to-door transfers for passengers on their longer cruises who live within 250 miles of the port. On most lines, if you ask your stateroom attendant to draw you a bath, due to some difficulties with the language, they will probably dutifully return with a pad of paper and a pencil (or charcoal if you have premium accommodations). But thanks to a new luxury service on Norwegian Cruise Line, your butler will know just what to do. Nothing but the best for passengers aboard Seabourn Sojourn’s world cruise (beginning January 4). Seabourn is bringing aboard four Michelin-starred chefs to not only demonstrate their expertise for passengers, but they will also be lending their signature touches to the menus. As a special bonus, they will also be joining passengers socially on many occasions. 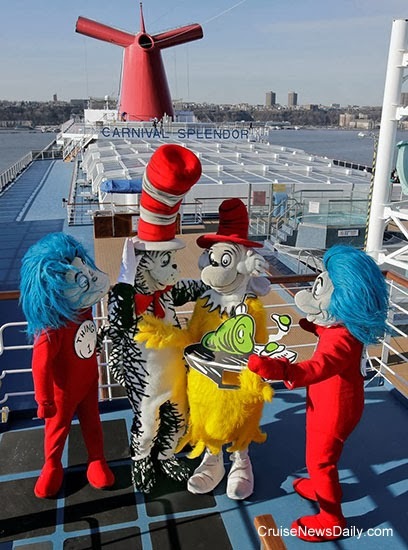 Dr Seuss-themed activities and characters will be added to most Carnival cruises by the end of 2014. The program will be introduced to kids and their parents at a themed breakfast on the first sea day. 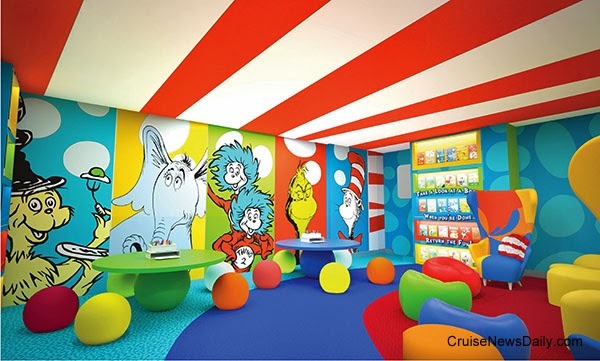 The themed activities will be available on all ships, but the Dr Seuss Bookville lounge will be added only to selected ships. 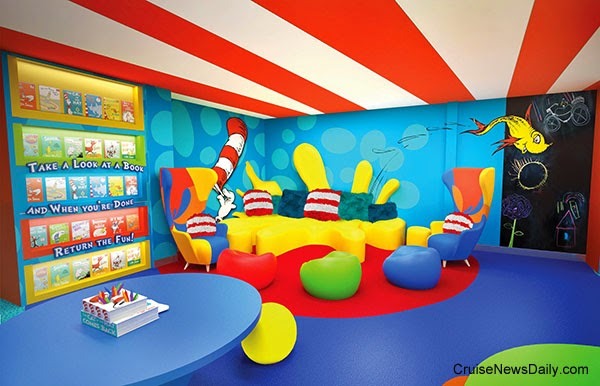 Rendering of the Dr. Seuss Bookville lounge which will be installed on several Carnival ships. The video below, shot at the press launch, will give you an idea of the Green Eggs and Ham breakfast that will be presented the first sea day. (The cost will $5 per person, but it is the only activity for which there will be a charge.) It will feature whimsical Dr Seuss-themed food and a chance to meet the characters one-on-one. 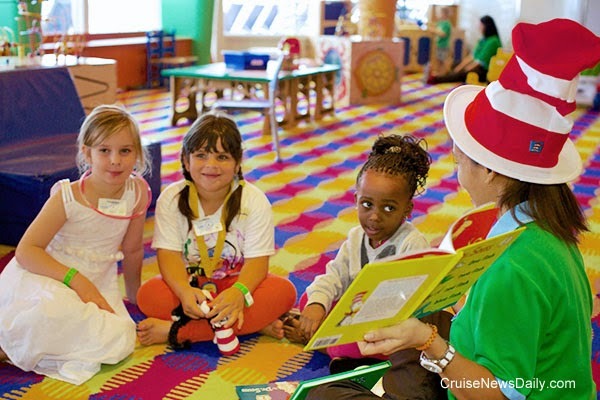 Reading activities will also be part of the Dr Seuss-themed activities on all ships. Photos and video courtesy of Carnival Cruise Lines. May not be copied or used without permission. All rights reserved. As the entertainment spaces get bigger on Royal Caribbean ships, the entertainment gets more complex and elaborate. As more and more specialty entertainers are needed, Royal Caribbean has been looking for somewhere for them to train. Today they announced what they think is the perfect solution. Through a partnership with Florida International University, Royal Caribbean will be building their own training/rehearsal facility on FIU’s Biscayne Bay Campus. Artist's conception of Royal Caribbean facility at FIU. Move over, Fun Ship Freddy! You will soon have company in the character locker room on the ship. Carnival Cruise Lines has tapped into one of the most iconic series of children’s stories for their kids’ programming. 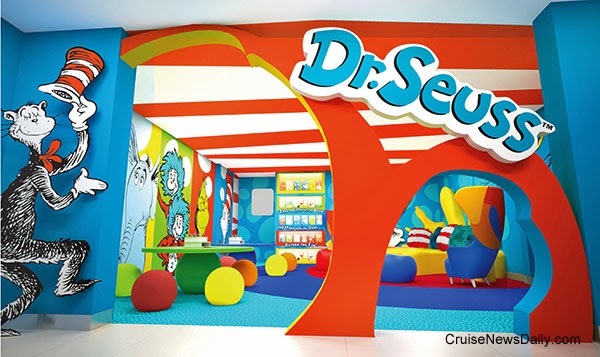 The lovable characters from the imagination of Dr. Seuss will soon be aboard Carnival ships, and the onboard programming for kids will include elements from many of the stories. Mondays seem to be bad days for lifeboats on Royal Caribbean ships, because in the last two weeks, on Mondays two different RCI ships have experienced malfunctions that resulted in a lifeboat being left behind. When you think of Meyer Werft, you probably think of large cruise ships, sailing down the river Ems, away from the inland yard toward the sea. 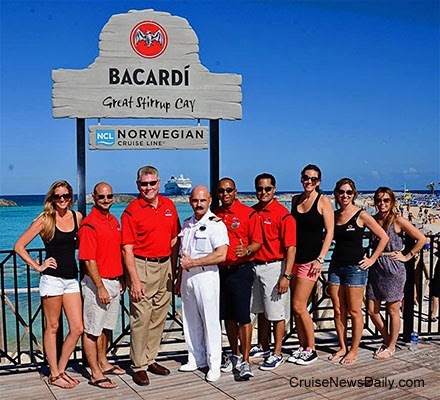 CND subscribers also read about the winners (more) ... and new Bacardi Bar opens on Norweigan's private island. A-ROSA Flora arrived at Meyer Weft on December 4 (2013) where it will spend the winter awaiting delivery to the line in April. It joins three Viking ships also awaiting spring delivery. SANTA CLARITA, Calif. (December 10, 2013) – Princess Cruises is honoring passengers’ favorite Caribbean and Panama Canal tours with its 14th annual CRUISE service awards. Recognizing the most popular shore excursion experiences and tour guides from the 2012-13 season, the awards are based largely on passenger feedback. Chosen from the extensive line-up of shore excursions offered on Caribbean and Panama Canal cruises, the awards highlight the important role local tour operators play in each destination as part of a passenger’s overall cruise experience. Winners are determined largely by tour scores and comments made on passenger surveys. A number of tours have topped the list for several years, and five of them have been passenger favorites for five or more years in a row. One excursion -- the Americas Cup 12-Metre Yacht Regatta tour in St. Maarten -- has now been voted ‘Shore Excursion of the Season’ for that port for the 14th year in a row. CURACAO – Helene Desiree Maas of Funbini B.V.
More information about Princess Cruises’ land tours and shore excursions is available at princess.com/excursions. Seattle, Wash., Dec. 10, 2013 — Holland America Line and Seabourn have promoted Gregory Crick to director of planning and administration in the Guest Programs Department. In this role, he will be responsible for leading the Group and Account Services Department, Access and Compliance, Ship Services, Reservations Accounting and the Family Assistance Program that includes the company’s Care Team. Crick will report to Timothy Murphy, vice president of guest programs and operations administration. Crick joined Holland America Line in 2007 in the guest relations department. Prior to joining the company, he was in customer service management with Nordstrom and worked as director of operations at the boutique Four Sisters Inns properties. He holds a bachelor’s degree in organizational communications from Eastern Washington University. (Ft. Lauderdale, FL -- December 10, 2013) Ultra-luxury Silversea Cruises today announced the promotion of Kristian Anderson to general manager of the Fort Lauderdale office and senior vice president of sales for North America, effective December 16, 2013. Anderson, who joined Silversea in June 2012 as vice president of sales for North America, is a travel industry veteran with over 25 years of sales and management experience. In his new position, Anderson will continue to develop and accelerate revenue growth throughout the Americas. He will report to Enzo Visone, Silversea's chief executive officer. Ellen Bettridge, president of the Americas, will leave on December 16. Most cruisers really don’t think about their cruise ship being a collection of parts, each made by very specialized manufacturers. About the only time they hear about those manufacturers is in news stories when a piece of the equipment breaks and is causing problems for the ship. CND subscribers also read about it being warm inside (more) ... and the pool party being delayed (more). 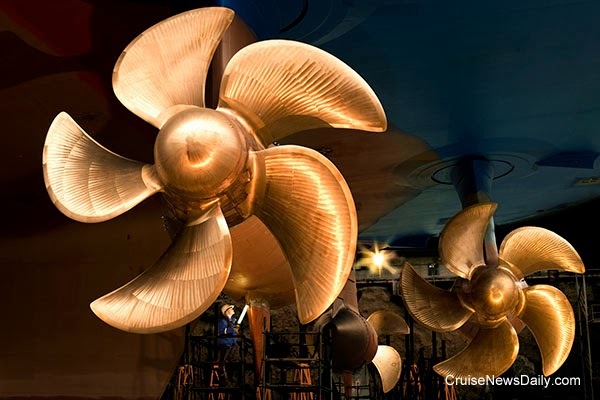 ABB has had a record year of sales of their Azipod propulsion systems for cruise ships. The company is closing the 2013 year with sales of Azipod systems for six cruise ships to be delivered through 2016 totaling $180 million. The Azipod propulsion system is an electric propulsion unit, which is housed in a submerged pod underneath the ship's hull. The pod contains a variable-speed electric motor which drives a fixed-pitch propeller, and can be rotated to provide propulsion thrust freely in any direction. 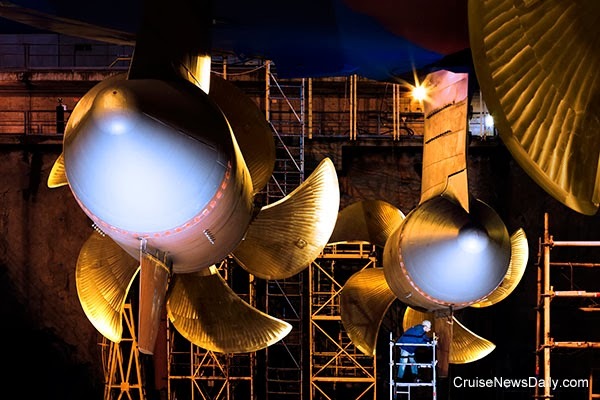 The Azipod propulsion system eliminates the need for rudders, stern thrusters or a long shaft lines inside the ship’s hull. 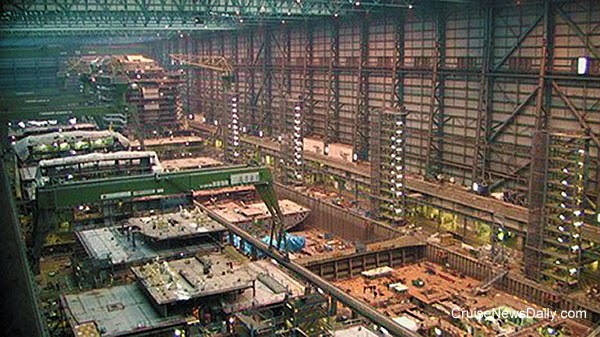 The two Azipod units shown here in a dry dock are affixed to the underside of a ship's hull and would normally be under the water. Photos courtesy of ABB. May not be copied or used without permission. All rights reserved. 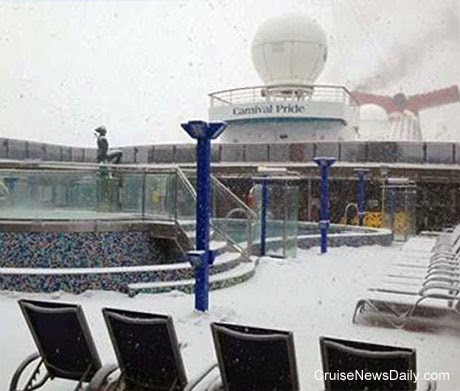 Carnival Pride turned around at Baltimore yesterday (December 8, 2013) and passengers had a somewhat unusual sight on a Carnival ship - several inches of snow on the deck. Needless to say, the sailaway party moved indoors. Photos courtesy of Carnival Cruise Lines. May not be copied or used without permission. All rights reserved. 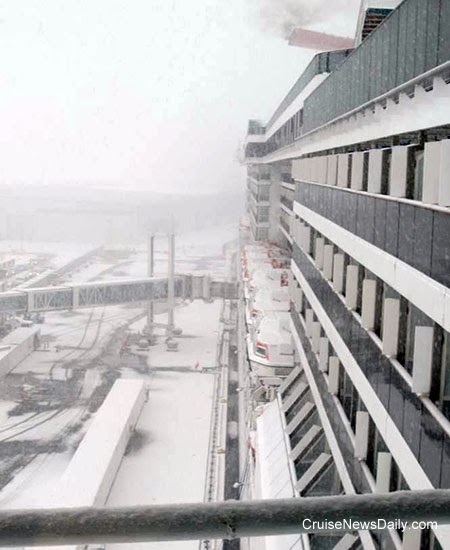 Meyer Werft's covered building dock allows construction to continue on Royal Caribbean's Quantum of the Seas throughout the German winter. This photo was taken of the ship's hull this morning (December 9, 2013) showing the continued progress.